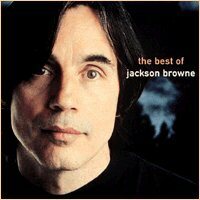 Rochester, NY: On Friday, May 17, 2002, an ever-youthful and effervescent Jackson Browne reminded the Rochester, New York fans in attendance the he's alive and remains a vital player in the American music scene. During the same week that this upstate region observed their annual "Lilac Festival" - Jackson fans celebrated their love affair with the contemplative rocker with a "request fest" of their own. The often raucous crowd made their presence felt early and often throughout the night with Jackson making a determined effort to satiate the more than 2000 fans present in the city's Auditorium. After opening the show with the title-track from 1994's "I'm Alive" - the reaffirming anthem from the CD that marked a return to the style of music that he built his loyal following upon - the crowd started in with their suggestions. When an impatient member of the audience screamed out "These Days" for a second time Jackson replied, "I heard you," and launched into the introspective ballad from 1973's For Everyman. Mr. Browne then moved to the piano and told the crowd "I don't want you to think I'm going to sit up hear and do everything you want me to" and then performed "Jamaica Say You Will" from his self-titled debut and "Farther On", the first of several songs from 1974's landmark collection - Late for the Sky. Mr. Browne briefly stumbled during the first verse of "Farther On" and told the crowd, "every night I forget the words to a different song." But, the audience was still in control. One attendee requested a "new song" but when another member of the audience yelled out, "Jackson, I'm from Syracuse," he got sidetracked for a few moments and offered some memories from past dates played upstate. "It's funny what you remember about a town," Jackson said, as he relayed the story of seeing a streaker run about during that craze in the 70's. He also reminisced how he met his good friend, Bonnie Raitt, there during the same time period. His memories about Rochester were more concealed. "Rochester, the strangest thing that ever happened to me in my life happened here, but I'm not gonna tell you what it was," Jackson said. "I might write a song about it one day, but I doubt it..."
After playing the new track, "Love Wants to See," Mr. Browne completed the first half of the show with a number of songs including the requests "The Times You've Come", a song in which he used and praised the "Bird of Paradise" capo (manufactured in Rochester) and his most-recognizable hit, a reworked acoustic version of "Running on Empty." Mr. Browne commented that on this tour, a solo jaunt covering several stops along the east coast, there was no set list and that it was nice to have the freedom to play what he wants to. "Usually, I save these songs for the end of the night, but since you requested it, I'll play it now" before performing his historic ode to life and its changing journey. Prior to its performance he introduced some old friends who were manning the cameras, recording and documenting the evening's show. Mr. Browne began the second set with a cover of Little Steven's "I Am a Patriot" a song that he has made into his own over the years and one that is now covered by several other recording artists, including the alternative rock band Pearl Jam. Then the requests began anew. When a fan in the first few rows raised his hand to ask for another "new song" Jackson obliged, and when it was finished he told the member of the audience, "that raising your hand thing worked out pretty well for you." Sure enough, before he could play another song dozens of hands were raised to alert Jackson to their requests. When one female member of the audience complained about the injustice of this system, Jackson agreed. "There's nothing really fair about this," Jackson said, noting that he could only see out into the first few rows of the crowd, adding, "and, it's too much like school." He also said the screaming method wasn't too fair either, because only those with the strongest voices who we're "really into sports" could make their requests stand out. After treating the audience to renditions of his classics "Rosie," "Late for the Sky" and "Fountain of Sorrow," Mr. Browne tried another method to get the audience involved. Jackson asked the crowd if they would rather hear a "dark song about death and suicide" or a lighter number about "waking up in love." When the audience's response was judged to be about even Jackson commented this was sad and evidence of a "schizophrenic crowd" before playing both. First, his classic "Song for Adam," an ode to his fallen childhood comrade followed by "Call it a Loan" from 1980's Hold Out collection. After playing a montage of his classic "Doctor My Eyes" and the new "My Imagination" a female fan tried a different approach. She walked up to the stage to make a very personal request, asking Jackson to play "The Pretender" for her father. Jackson was happy to do so and told her, "That's so cool. That was such a nice thing to do for your dad." The notable turn-downs included, "The Late Show" which Jackson didn't think he could get through, and "I'll Do Anything" another track from I'm Alive, requested in both of the evening sets. "I like that song, too. I don't really know that song, though," he said when the first request came through. In the second set, when it came up again, he hummed a few bars trying to jog his memory. The crowd of mainly 30-50 somethings, with a good number of the younger generation mixed in, seemed genuinely pleased with the evening's show, as did the casually attired and relaxed looking Browne, who was self-assured, humorous, and in particularly good voice. "Every show is different, I know it sounds like B.S," he told the assembled, explaining his feelings for the Rochester fans. "But, I can't explain it, you are quite unique." The evening's performance was highlighted by numerous standing ovations and insights into the origins and history of many of his songs, including the recent experiences he had hearing Spanish and Cantonese interpretations of his and Glenn Frey's "Take it Easy." "I could write a book about this song," Jackson said of the many versions recorded and performed over the years the including, most notably the one by the Eagles.